Mainly composed of single-handedly arranged stones, Dreamwoods, located in a forest in northern Italy, is one of the few sites in the field of European art environments made almost exclusively from a large variety of stones ¹. 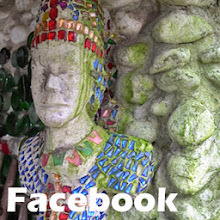 The self-taught artist who created this artwork was born in 1949 in Duderstadt, Germany as Manfred Flucke. After primary education, he went to Hamburg to study sociology and history, after which he for some years wandered around making paintings and drawings, until he in 1977 felt inspired by meditation. He joined Osho's movement and renamed Deva Manfredo around 1980 he moved to Italy where he went to live in Osho Miasto, the biggest Osho center in Italy, located in a beautiful area in Tuscany, not far from Sienna. He would reside there for some 25 years, working as a graphic designer, photographer and barkeeper. 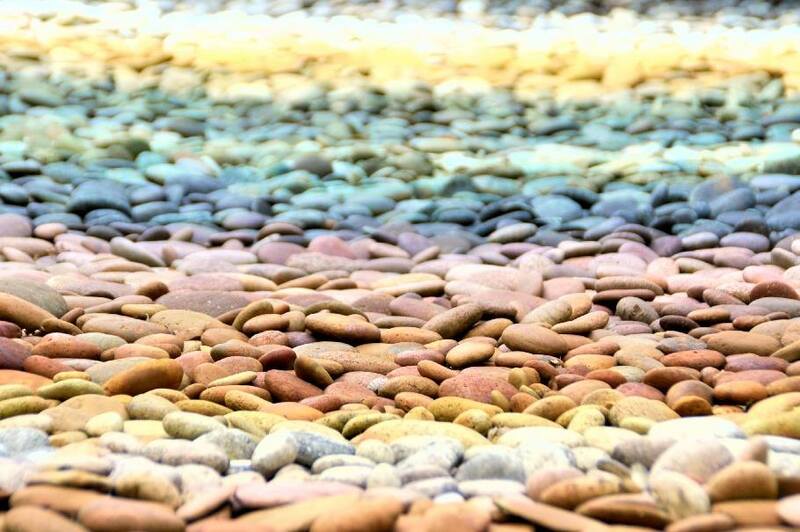 In an interview Manfredo said: "Since I was a child I was fascinated by the beauty and form of stones, particularly the ones which have been polished to perfection by the to and fro of the ocean waves". He especially likes the immobility, timelessness and eternity of this material. 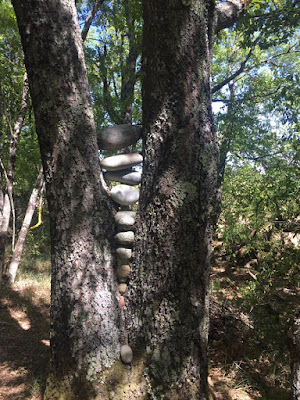 When one day around 1980 he just by chance was busy with some stones and felt that by arranging them he had created something beautiful, he got inspired to make a number of such creations and install these in a natural area. So soon after Manfredo had settled in the Osho center, he began to consider setting up an outer space with a specific collection of stones. 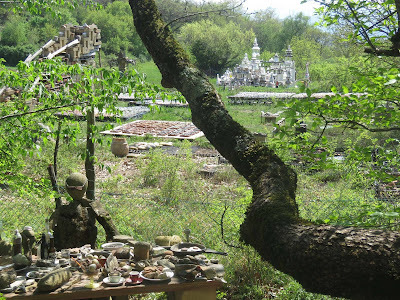 He was aware of a place in an extensive oakwood near the center where he lived and in 1981 he installed there his first stone works. 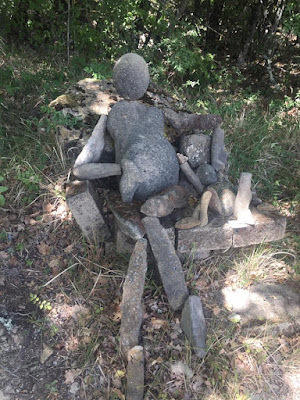 The forest was not his property, maybe it belonged to the commune, but anyhow initially there was no question of appropriation, because the site remained without a fence and the stones Manfredo used for his compositions were laid loose on the ground or on another. 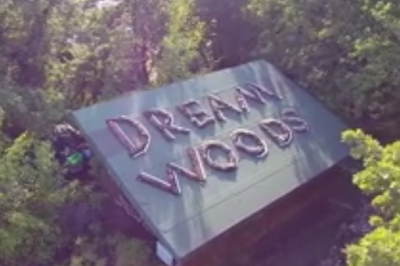 Currently, some 35 years later, the land is rented long-term from the owner of the grounds, the site has some 200 creations, some quite a size, there is a gift shop at the entrance and paths run through the forest, but there still is no fence and the animals of the forest have free access. 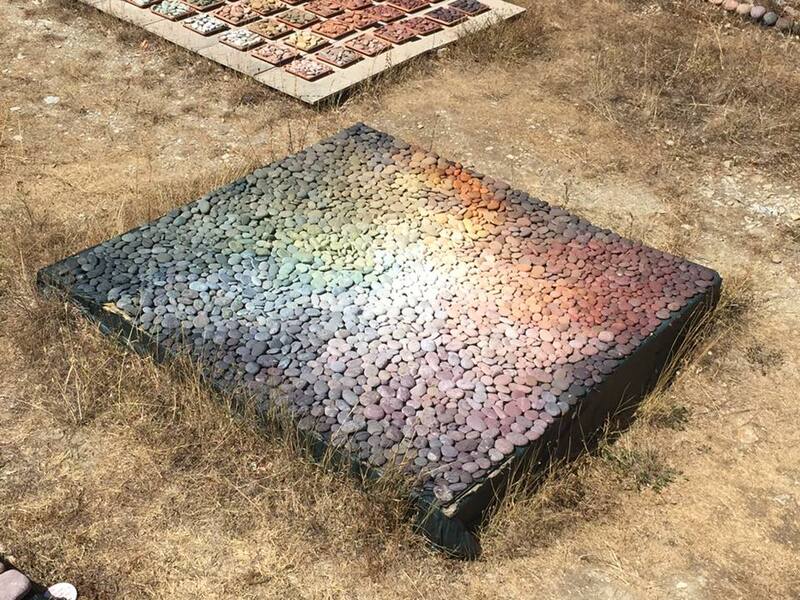 Sorted into a large compartmentalized storage box, Manfredo has a large stock of stones in many colors, an item already intrusive as such and rather useful to make multi colored planar structures. 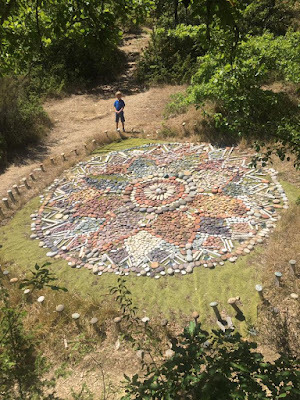 From his passion for meditation it is obvious that among the creations in Dreamwoods one finds a number of mandalas, circular geometric patterns of Hinduistic origin that symbolically depict the cosmos. The figure picture above shows that such a mandala can have a rather large size. But there are also less esoteric mosaics, often performed in squares or rectangles and located on the ground. 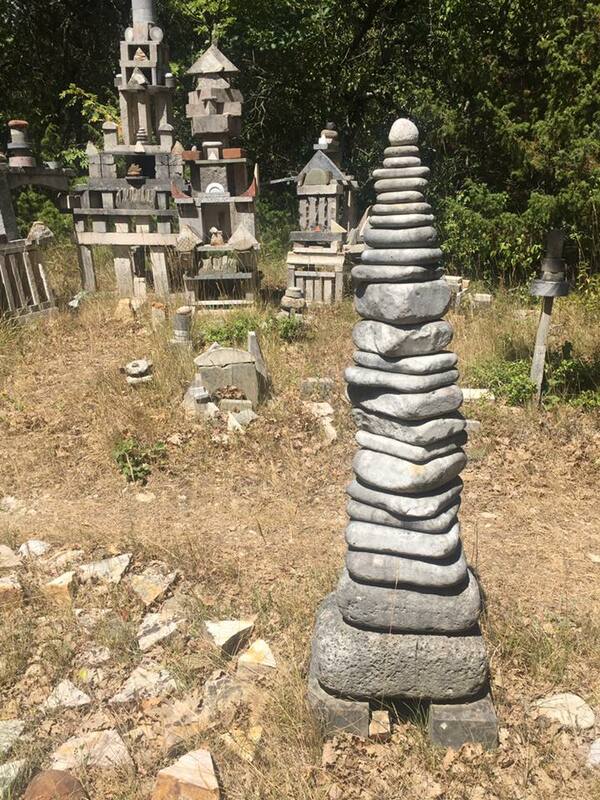 The site also includes a large number of vertical structures made of stacked stones, some standing on their own, others standing in a smaller or larger combinations. 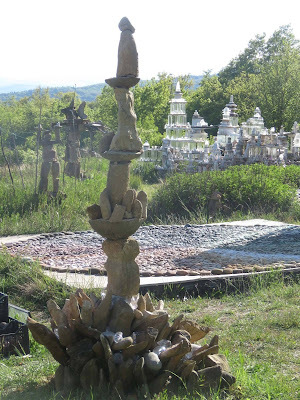 Piling the stones into stacks, Manfredo uses no glue or cement. The stones are just hold together by gravity. 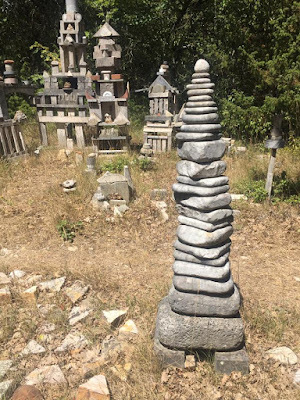 Some of these combinations of stone piles are grouped in such a way that one gets the impression to look at an impressive citiscape with a variety of high and low elements, some rising up to five meters. 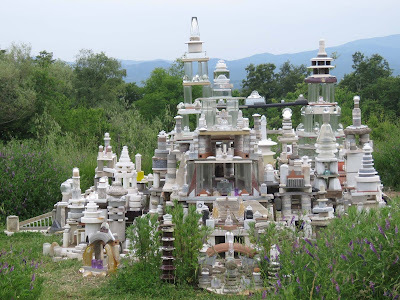 In some of his recent artworks characterised by rising stone piles Manfredo also processes glass, plastic and marble. At a later moment in his artistic development, Manfredo also began making anthropomorphic characters. 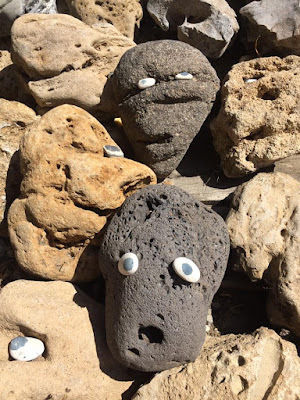 An observer of these creations said: "... 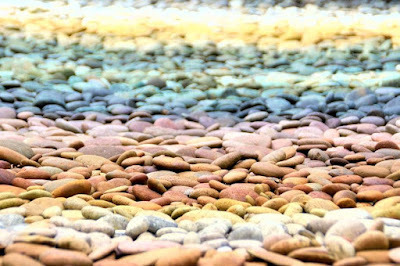 I have the impression that they do not seem to have been ‘put’ there, rather it is as if the stones had decided one early morning to arrange themselves into these forms". Visitors can follow a specified trail along the artworks in the forest. They are advised to make the walk in silence. Around 2006 Manfredo left the Miasto commune. He has kept "Manfredo" as his artist name and currently lives in a Tuscan village. 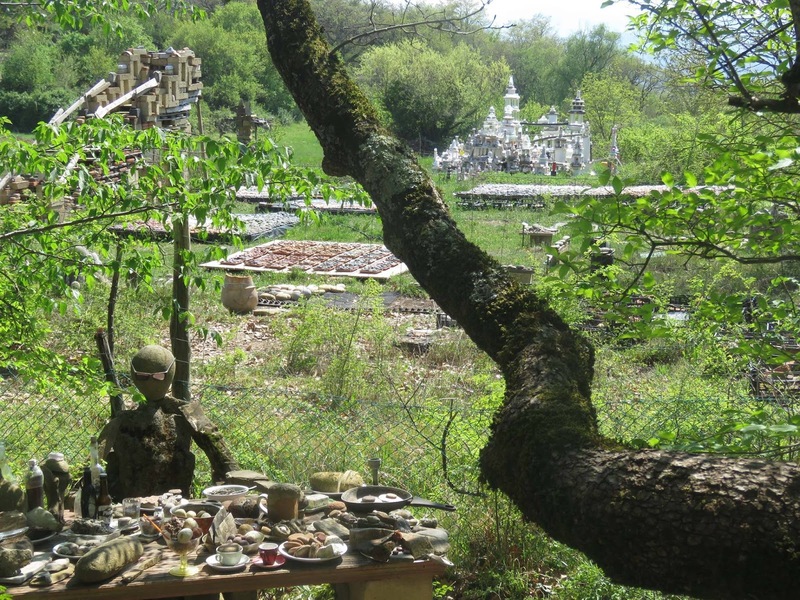 The site in the forest is closed from november until end march and during these months Manfredo may make trips abroad, visiting family members and old friends in his hometown Duderstadt or collecting stones from beaches or rivers all over Europe.